Best Things to Do in Costa Rica - Exciting Activities for Everybody! Don't Miss Out on the Best Activities During Your Vacation! Even after 2.5 years living in Costa Rica, I’ve barely cracked the surface of all the possible activities in Costa Rica. Between rainforests, cloud forests, beaches, volcanos, waterfalls, rivers and national parks it’s impossible to try and narrow down the best attractions and best things to do in Costa Rica. Below I’ve listed some of the best adventure, relaxation, nature and cultural activities available in Costa Rica. 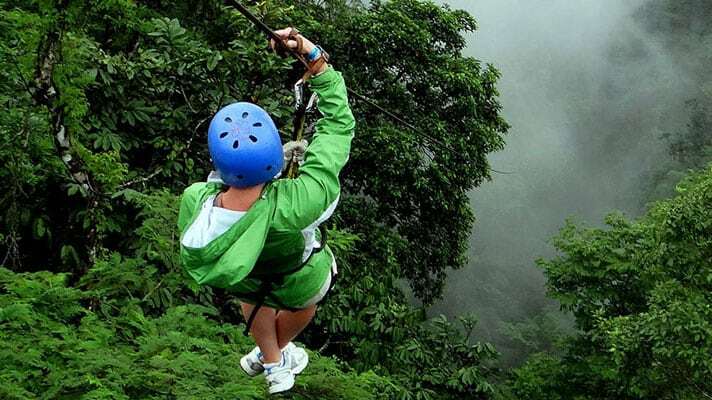 Zip lining in Costa Rica should absolutely be a priority on your vacation to Costa Rica. It’s probably the closest you’ll ever get to flying. Zip lining is available all over the country and well regarded by tourists and locals alike. 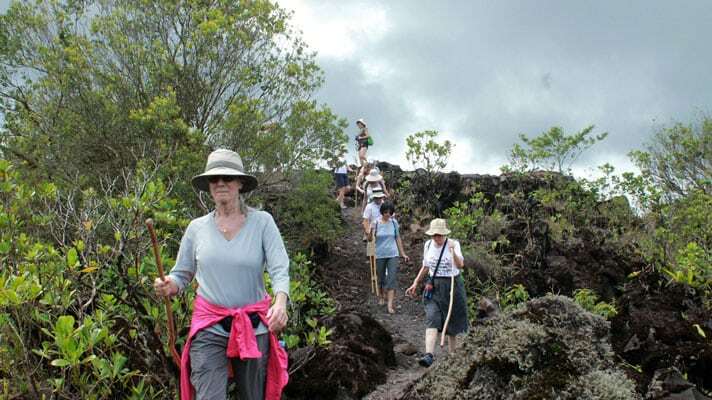 After a safety demonstration and practice session, you’ll usually start with a short hike (the hike at Arenal was beautiful, it overlooked the lake and the volcano) before you get to the first line. They usually start you off with a shorter line and build up to the best one. Once you are safely connected you’ll soar over the canopy, rivers and cliffs. The guides are friendly, bilingual and attentive and I’ve never felt unsafe. I’ve gone zip lining in Monteverde, Rincon de la Vieja, Arenal and the Central Valley. Monteverde is probably the coolest one because you get to do the Superman zip line and Tarzan swing. Last friendly piece of advice: don’t force a member of your group to try it. Zip lining requires a healthy amount of bravery and risk taking and it is not for people who are deathly scared of heights. I once saw a teenager break down in tears because his family was pressuring him to do it (why do something you won’t enjoy anyway?). Costa Rica is one of the most beautiful places in the world to go white water rafting. I’m personally terrified of drowning so rafting is a rather nerve-wracking experience for me, but I’ve done it a few times and never felt like I was in any danger. 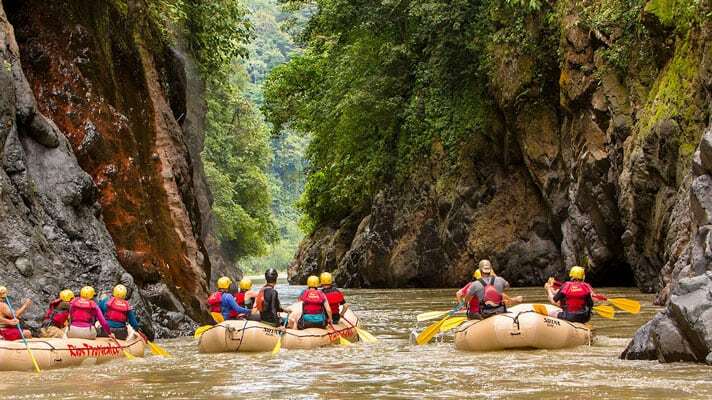 You will find White Water Rafting destinations throughout Costa Rica ranging in intensity from class II & III – ideal for beginners – right up to class V rapids for the experienced adrenaline junkie. In my experience you load up two to a raft, one guide and one tourist. One time I went with a 12 year-old and she rode with the guide and me. The rapids tend to come in spurts so you have moments of tranquil floating through the forest (my favorite part) to get pumped for the next round of rapids. Be ready to get thoroughly soaked and don’t wear your glasses! Welcome to the Birdwatching Republic Costa Rica! 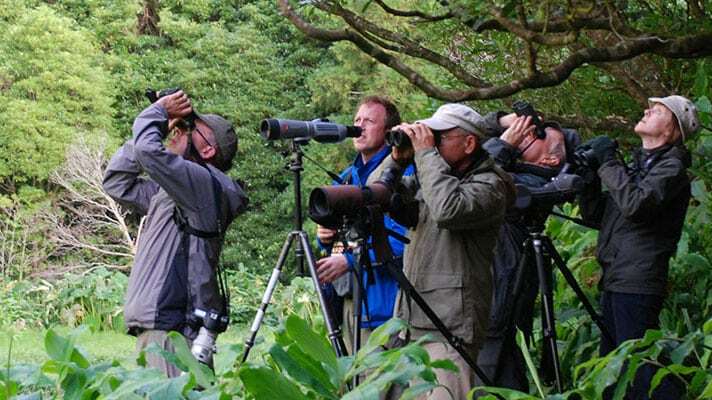 With over 920 species of birds, people visit Costa Rica from all over the world just to go birding in Costa Rica. The 5 different eco-zones (Central & South Pacific Lowlands, Caribbean Lowlands, Caribbean Foothills, Northern Lowlands and Highlands) make for incredible birdwatching or entire birding vacations in Costa Rica. Be prepared to spot Macaws, Toucans, Hummingbirds. With luck you might even get to see the Resplendent Quetzal. In any case, be sure to take your camera and binoculars and try to visit more than one eco-zone to see as much diversity as possible. Costa Rica has up to 50 world-renowned surf breaks all over the country. Beginners, intermediates and advanced surfers can all find a perfect beach to try out. The best places to surf include Caribbean Coast, the Osa Peninsula, the Central Pacific area, Nicoya, and Guanacaste. Surfing lessons are ridiculously easy to find. You can simply walk onto the beach and find lessons, stay at surfing hostels, ask locals or look on the internet. Just make sure your guide is clear about what level you’re at and that the waves you are trying out are the right level for you. There are over 7,000 marine species in the oceans surrounding Costa Rica, which makes for some incredible snorkeling and scuba diving. If you’re snorkeling you can either go out with a boat or start from the beach. If you go to the right place you’ll get to see a variety of colorful tropical fish. If you are visiting the Caribbean Coast, you should not miss out on the reefs of Cahuita National Park. On the Pacific Coast you should check out Caño Island, Tortuga Island, Tamarindo, Flamingo, and Papagayo. Even if you don’t plan on it, if you vacation in Costa Rica, you will end up doing some sort of hiking to get to most attractions. Don’t worry though, hiking is one of the best parts of visiting Costa Rica. I recommend taking guided hiking tours when possible. The guides are trained to find animals and point them out to you. It’s usually easy to spot monkeys and iguanas on your own, but it’s much more tricky to see sloths, birds, frogs or snakes. There are also several different kinds of hikes. You can hike deep into cloud forests, up steep trails, along a volcano or over rocky beaches (my personal favorite). There is so much incredible wildlife and scenery to explore in Costa Rica and there is no better way to do it than by foot. Don’t forget your camera and watch out for sneaky monkeys trying to steal your snacks. For a long time I thought doing yoga in Costa Rica was a little cliché–until I got obsessed with it. I actually got obsessed watching videos in my apartment in San Jose, but since then I’ve learned that Costa Rica a top destination for yoga enthusiasts, and for good reason. You can find yoga classes at almost every attraction including volcanos, on the beach and in the rainforest. Even if you’ve never tried yoga, I recommend taking a beginner class while you are here. Worst case scenario you get a nice stretch on a beautiful beach, best case scenario you fall in love and stay in Nosara forever to become a permanent yogi. Costa Rica may be small but it has hundreds of awesome waterfalls that you can rappel down. 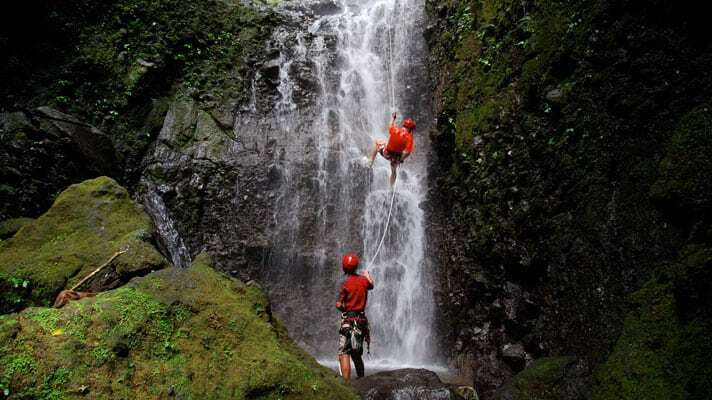 Rappelling in Costa Rica is a perfect way to escape the hot sun for a bit and refresh inside a waterfall. Believe me when I say it’s SO FUN. Rappelling down a 100 foot waterfall sounds frightening at first, but the tour companies know what they are doing and as soon as you sit back you feel confident that they have control of the situation. Then you just get to relax and let the falls cascade over you. If it sounds dreamy and idyllic, it’s because it is. The only thing that brought me back to reality was almost losing my glasses into the abyss. Thankfully I caught them in time, but I recommend leaving yours behind. If you’re rappelling I also recommend going canyoning as well. It includes rappelling, zip lining and hiking through rivers. I did it at Arenal and it’s one of my favorite memories in Costa Rica. I had some qualms about horseback riding in Costa Rica before I went. I’m not very confident on horses and I was worried about abusing the animals. However it turned out to be pretty fun. The horses were clearly well taken care of and rotated so the same horses weren’t used all day. Tour guides did a good job getting us set up, and it was a cool way to see the forest. The horses were very calm. In fact, halfway through the tour a huge snake crossed in front of the first horse, which was carrying a 12 year-old. Everyone else’s hearts dropped to their stomachs, but the horse only spooked slightly and the snake went on its way. 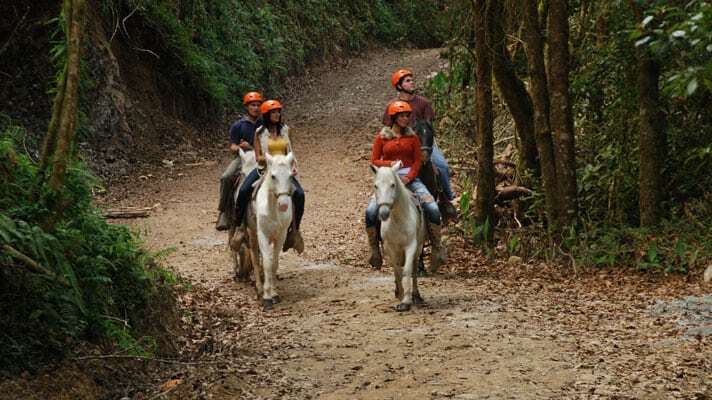 I rode through the Rincon de la Vieja National Park, but there are opportunities to go horseback riding all over the country. Just make sure the tour company is certified and treats the animals well! So maybe you aren’t up for rappelling down waterfalls, but you should definitely visit some. The waterfalls in Costa Rica really do make you feel like you’re on another planet. Several are on private properties that the owners allow public access to (for pretty cheap). My favorite by far is Tesoro Escondido (pictured left). You start with a medium-length hike before you get to the magical, picturesque waterfall where you can picnic on the rocks, take pictures and swim. (Beware, the water is very cold.) You’ll also want to make sure the waterfall you choose to visit is open before you go if you are visiting during the rainy season. One note about La Paz Waterfall Gardens–the waterfalls are beautiful, but because they are located close to San Jose they get pretty crowded. The list could go on from there. Tubing, kayaking, paddle boarding, mountain biking, coffee excursions, catamaran tours, ecological night walks, hanging bridges are all great Costa Rica activities to take advantage of while you’re here as well. Before you go, check out our video about birding in Costa Rica!